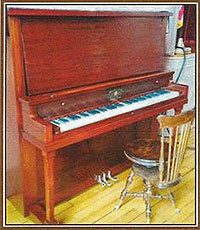 As you know, the Sandwich Town Hall has an 1894 piano with a rich history associated with the Hall. It was the original instrument that was used to accompany the silent movies that were shown in the Hall during the 1920s, and even earlier. It is owned and maintained by the town and the Sandwich Town Hall Trust uses it during our Silent Film series which we produce every year. It is also a key component of the Town Hall Radio Musical Show as it adds to the flavor of those performances. While this piano if a wonderful piece of history, it is not designed to be a concert instrument. 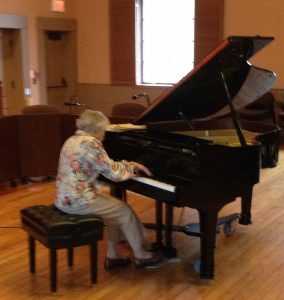 The Sandwich Town Hall Preservation Trust is proud to announce that it has recently acquired a baby grand piano which will allow for the presentation of professional concerts. It was generously given by Mary Coleman a resident from Eastham who wanted it “to be used in the furtherance of good music on the Cape.” It is a beautiful 5′ 8″, 1990 Yamaha piano with a polished ebony finish which has been lovingly cared for and is in superb condition. The piano was originally purchased in Sandwich 27 years ago and its history has come full circle as it now in our Town Hall courtesy of Mary’s generosity. It is our plan to work with the Sandwich Arts Alliance and other groups to encourage musical productions using this grand piano. The Trust has paid the cost to have it moved and absorbed additional costs to have it supported with a dolly on wheels so that it can be easily and safely moved across the 1834 Town Hall floor. A cover has also been purchased for its protection. The Sandwich Town Hall Preservation Trust has accepted the ownership and the Trust will pay for future piano maintenance and tunings. Sandwich officials have agreed to have it kept in the Hall. A special ceremony was held at the Sandwich Town Hall at 10 am, Saturday, February 27, to thank the F. Daniel Haley Family for their generous gift of $10,000 to the Town of Sandwich for the Preservation and Maintenance of the Sandwich Town Hall’s historic 1894 piano. Jane Ellis, a friend of the entire Haley family, sang Old Cape Cod, and was accompanied by a pianist on the historic piano. Jill Haley was an outstanding athlete and grew up in Sweden where she was a member of Swedish National Ski Team. Present were the entire Haley family: Daniel Haley; his oldest son Colin with his wife Rachel and their sons Kaj, Jack and Joey; his son Kaj; and his daughter Linnea. Friends and acquaintances of the Haley Family, members of the Sandwich Town Hall Preservation Trust, and friends and supporters of the historic Sandwich Town Hall piano were in attendance. We also want to thank all those who made such generous contributions at our piano fundraiser “Tempo & A Teapot” on April 19, 2015. Pianist Ruth Weaver performs at a FUNdraiser Tea to restore the Grand Old Girl, the historic Sandwich Town Hall piano. Manufactured in 1894, this is the very same Frederick piano used to accompany silent films in Town Hall in the early 1900s! In the early 1900s silent movies began to be shown in the Town Hall and a piano, an upright in the Mission style made by Jacob Doll & Sons for the Frederick Piano Company, was acquired. Its serial # 11860 confirms that it was made in 1894. This very same piano is still in use today! Jacob Doll was one of the larger and more successful piano manufactures of the early 20th Century. Jacob Doll established his firm in 1871, building very high quality upright, square, and grand pianos. Jacob Doll passed away in 1911, and the firm was taken over by his sons, thus forming the Jacob Doll & Sons Piano Company. 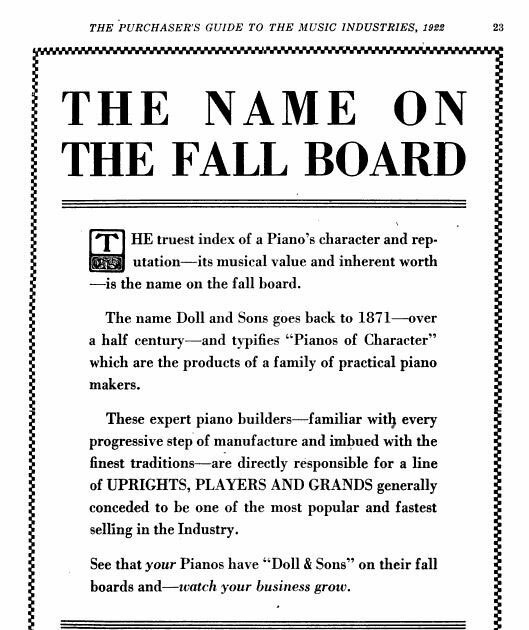 The company manufactured nearly every essential component of their pianos according to a contemporary newspaper account. The Sandwich Town Hall piano was played by local residents, Minne Bunker, Eva May Harlow, and Mary Haines Morrow, to accompany the silent movies. The projectionist, one of whom was Bill Wimmer, turned the film by a hand-crank illuminated by a carbon-arc. A primitive generator located in a garage across the street from the Town Hall provided the electricity. Nonetheless using a carbon-arc projector was dangerous business and likely to set a building on fire. To protect the Town Hall from fire, the projectionist was provided with a urinal and required to remain continuously on duty when the carbon-arc was running. It is said that occasionally the engine of the generator would fail, the screen would dim, and boos and hisses would arise from the audience who had paid a nickel to attend. Four years ago the “Save the Town Piano Committee” raised over $5,000 to restore the historic Town Hall piano that had served for nearly a hundred years at silent movies, dances, and concerts. Restoration included refinishing the mahogany exterior case, replacing pedals and damaged strings, and ensuring that the historic piano would once more serve the Sandwich community. Recently, we have found that the piano has required re-tuning after every use, and experts have informed us that a full historic restoration is required to bring the piano up to contemporary standards for upright pianos. To do this we are seeking and encouraging funding by Sandwich residents, the Sandwich Community Preservation Committee, the Sandwich Cultural District, the Officers and Selectmen of the Town of Sandwich, and all who seek to preserve this unique part of Sandwich’s history. The cost of a full restoration of the piano is currently estimated to be $16,000.We welcome your support by a tax-deductible gift to the Sandwich Town Hall Preservation Trust, a federally-recognized non-profit organization and by the support and encouragement of the community organizations to which you belong. Among the men in the piano trade who carved their success unaided and by the force of sheer determination JACOB DOLL stands pre-eminent. Born at Rohrbach in the Grand Duchy of Baden Germany in 1849 Doll left the fatherland just as soon as he had gone through the public schools arriving in New York at the age of fourteen. He found employment in a woodworking establishment the main business of which was to prepare lumber for piano manufacturers. The author became acquainted with Doll in 1869 while manufacturing portable music stands. Doll was then driving a delivery wagon for the mill in which the lumber for these music stands was prepared. Although he had not yet reached the age of twenty Doll was even at that time planning to start in business on his own account. A hard worker, by nature economical without being penurious, he accumulated sufficient money to start a planing mill of his own in 1871. His patronage came almost entirely from piano manufacturers and consequently Doll had a splendid opportunity to get well acquainted with the ins and outs of the piano business at that time. Progressive and ambitious he began in 1875 the manufacture of entire piano cases adding to this business also the making of covered strings. By 1884 he had so thoroughly picked up and studied all phases of piano making that he felt encouraged to start a piano factory. The much broader field which he found for his activity developed all the latent forces in Doll’s remarkably forceful nature. 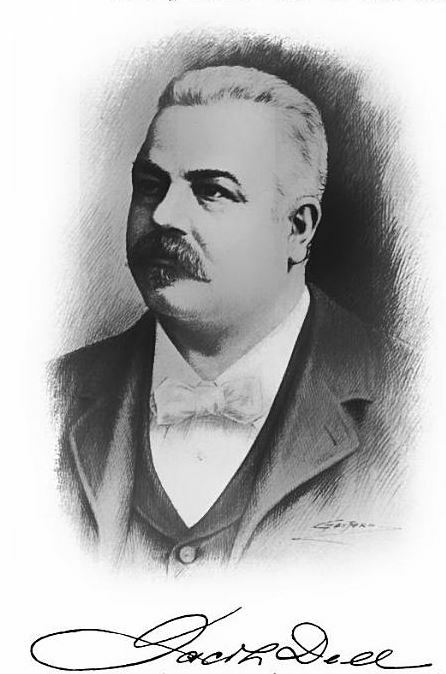 Adopting new methods of manufacturing as well as in selling pianos, he met with most substantial success and when one after the other of his five sons entered the business and became his assistants, his operations assumed dimensions which in the course of time made the firm of Jacob Doll and Sons one of the leading factors in the piano industry of the United States. Wrapped up in his business affairs to the extent of excluding any ambitions for prominence in public life, Jacob Doll was also intensely devoted to his family, providing for his five boys all the opportunities of a higher education and likewise watching with loving care and a free hand the development of his five daughters. He died on November 13, 1911, leaving a fortune of over two million to his family. The great business founded and built up by him is successfully carried on by his sons every one of whom has been trained by his father as a practical piano maker. In 1904 the business was turned into a close corporation and the eldest son, OTTO DOLL, was elected vice president, and since his father’s death is acting president. GEORGE DOLL is the treasurer of the company with JACOB DOLL JR. as his assistant who is also the general superintendent of the factories while FREDERICK DOLL has the management of their nine retail stores assisted by the youngest son. CHARLES DOLL who joined his brothers in 1910 and was elected secretary in 1911. Jacob Doll and Sons have been among the pioneers in the manufacturing of player pianos and have always made a specialty of coin operated electric pianos. The continued success of the concern is a telling illustration of the great results which can be accomplished by harmonious team work. DOLL & SONS INC JACOB Incorporated with a capital of $1,000,000 all paid in. Otto Doll, president; Frederick Doll, vice president; George Doll, treasurer; Jacob Doll Jr., secretary and assistant treasurer. Make the Doll & Sons piano and player piano. This concern is one of the largest and most enterprising manufacturers in the piano industry devoted to the manufacture of pianos of the highest grade. They have an extensive finely equipped up to date plant with all the latest improvements at Southern Boulevard Cypress Avenue and 133rd Street, New York. Have one of the largest factories devoted to the manufacture of pianos and player pianos in the East. Have retail warerooms at No. 112 West Forty-Second Street, New York City with branches at Newark, NJ, Paterson NJ, Jersey City NJ and Brooklyn NY. Manufacture grands uprights and playerpianos. This business was started in 1871 by the late Jacob Doll who passed away on November 13, 1911, after a brilliant and notable career. He left as a monument to his memory this plant capable of producing 15,000 pianos annually. To the far sighted policies of the founder of this business his sons, the present officers of the company, are indebted for their exhaustive schooling as mechanics, as before being admitted to partnership in the firm, they were obliged to master every detail of construction. As these sons have practically had charge of this business for a number of years, no institution in the trade possesses a membership whose individuals are more earnestly devoted to the advancement and increased prestige of their business or where family pride enters so thoroughly into the manufacture of their instruments. While the members of this house have already an enviable reputation for making pianos of the highest standard, the family pride enters so thoroughly into their manufacturing department that they are continually at work improving their instruments in every possible way with the result that their pianos to-day stand higher than ever in the history of the house, the small details being looked after as carefully as the big points in piano construction. Their instruments contain many patented improvements exclusively their own and practically every part of their piano even to the hardware is manufactured in their own plant so as to get the best and most economic results. Their player pianos are of the same high standard as their regular pianos. The same policy is adopted in that they make even their own player actions which are recognized as of superior merit and are exclusively used in their own player pianos. All their instruments are manufactured absolutely under the supervision of the members of the family and no instrument bearing their name leaves the factory without a thorough inspection by some member of the family. Financial and commercial standing unquestioned. A division of Jacob Doll & Sons Incorporated with a capital of $100,000. Manufacture the Frederick piano at their large finely equipped plant at Cypress Avenue and Southern Boulevard, New York City. The capacity of their factory is 3000 instruments per annum. The piano is manufactured to meet the demand for a thoroughly reliable piano that can be sold at a popular price and can be absolutely guaranteed to the customer by the dealer. It is recognized as one of the most popular pianos in the trade and for over thirty years has had a very big increase of sales every year. Has an exceedingly even well balanced scale of good tonal quality. Manufactured of fine material and workmanship with exceedingly attractive case designs. It can be classed as one of the most popular instruments in the trade. A perfect player piano which was put on the market a few years ago has attained the same high popularity as that of the Frederick piano. Concern in the highest financial and commercial standing.